The law, should it come into effect next month, would criminalize playing any national anthem but the Slovak one at public events on certain occasions — for example, public holidays — unless a member of a foreign delegation is at the event. The law also carries a fine of 7,000 euros. The law was seen as an outrage in Hungary. Hungarians make up about 9 percent of the population of Slovakia and are the country’s largest ethnic minority. The Hungarian minority of about half a million people could be fined thousands of euros for singing the Hungarian anthem at a match of FC DAC 1904, a soccer team based in what is now southern Slovakia with a large ethnic Hungarian population. The Synod Council of the Reformed Christian Church in Slovakia has issued a formal statement in response to a new law introduced by the National Council of Slovakia that restricts the use of the foreign national anthems within the Slovak Republic. “The majority of the members, congregations and institutional bodies of the Reformed Christian Church in Slovakia are Hungarian. Pursuant to the freedom of conscience and of religion, it is an inalienable right of our church to sing the Hungarian national anthem with faith, which is our national prayer and an integral part of our liturgy.” –reads in the Statement of the Church in Slovakia. 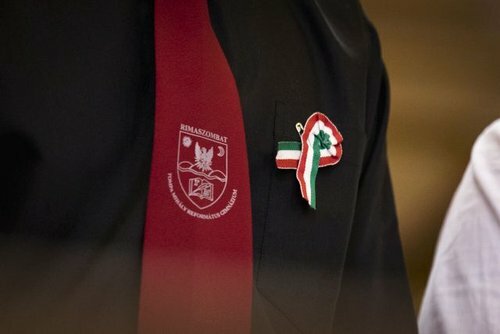 During its meeting held in Budapest on 11 April 2019, the Presidium of the General Convent – the institutional body of Hungarian Reformed church leaders within the Carpathian Basin – expressed its dismay at the so-called “national anthem law” in Slovakia. The General Convent approves and joins the statement adopted by the Reformed Christian Church in Slovakia on 6 April 2019, which condemns this discriminatory amendment. “We consider the 27 March decision of the National Council of the Slovak Republic to be a severe invasion into the public exercise of religion, which is a breach of constitutionality. The General Convent finds such a flagrant breach of the freedom of conscience and religion to be unacceptable. We hereby urge lawmakers in Slovakia to repeal this amendment, which is in breach of fundamental democratic rights. “- stated in the Statement of the General Convent.